Summary: During a terrible heatwave in 1991—the worst in a decade—ten-year old Anton has been locked in an apartment in the projects, alone, for seven days, without air conditioning or a fan. With no electricity, the refrigerator and lights do not work. Hot, hungry, and desperate, Anton shatters a window and climbs out. Cutting his leg on the broken glass, he is covered in blood when the police find him. Juanita, his mother, is discovered in a crack house less than three blocks away, nearly unconscious and half-naked. When she comes to, she repeatedly asks for her baby boy. She never meant to leave Anton—she went out for a quick hit and was headed right back, until her drug dealer raped her and kept her high. Though the bond between mother and son is extremely strong, Anton is placed with child services while Juanita goes to jail. Review: Thrity Umrigar most recently approached race relations in her 2014 novel, The Story Hour. After dipping her toe in the water with that, she fully wades in with her latest, Everybody's Son. Much like Shanthi Sekaran did in Lucky Boy, she explores the topic of who deserves to be a parent. Is is the person best able to care for a child financially or emotionally? Umrigar tells the story from the perspective of the adoptive parents and Anton. So much of who the parents are is tied to their wealth and their legacy, which already gives them a one up on Anton's biological mother. While they seemingly start off with good intentions, and no doubt believe that their intentions are good from start to end, their selfishness and arrogance are their undoing, at least in my eyes. In their attempts to give him a "good" life, they strip him of kinship with other African-Americans and, at the core, who he is as a black boy and man in America. Early on, Anton struggles with who is his in the lily white world of the Colemans, but eventually dwells in and thrives in the sunken place. It's no surprise that it's a shock to his system when he meets a black woman in college who challenges his belief system, as instilled in him by the Colemans, and forces him to open his eyes to how his adoptive parents have manipulated him and his mother. Umrigar tackles a lot in her latest and does it well. Is it fair to remove a child completely from his environment and/or his culture? Are you doing more harm than good? I think every case would have to be viewed individually. Anton is a smart character and may well have thrived had he stayed with his mother. In moving him away from what he was familiar with, the Colemans give him a better chance at success, but at what price? There's a lot to unpack and think about in just 352 pages. 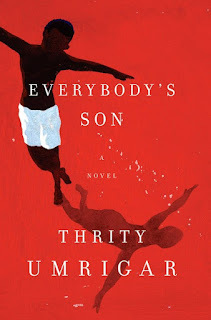 I can't wait to see what Thrity Umrigar takes on next.